Well it's done- all I have to do is the satin stitch overlay grid and the quilt is done. I struggled finding motifs for the last row, and just as I thought I couldn't possibly think of anything more, all of a sudden a few more popped into my head with the end result I ended up having some extras. The book will be available next wednesday or cd- whichever you prefer. Prices are in my previous blog post. And Picasa now allows you to put print on an image, so I will have to fiddle with that some more. I wished I had done a few motifs better, but as I always keep telling people when we look at drawings of artists we are looking for their individual impint of what they are seeing- and so it is with machine quilting! And some forms are easier to do than others.Not everyone has to do everything exactly the same as their neighbour! And as Gertrude Stein once said : "The problem with having a good idea is that someone else always comes along and does it better." However that shouldn't stop you from having ideas should it? Now I can get on with life and new things. I am inclined to begin another traveller's blanket, as there is still a lot to tell and to interpret- I was very taken by the dilapidated cathedral at Jumieux in Normandy, perhaps I could use the window shapes to embroider this time- views of the world. I spoke to Fiona Wright of Creative Arts Safaris the other day and she was very taken with the whole idea of the traveller's blanket as a way of journalling and recording travels- so it will be feature probably in her next newsletter. I have made a little installation of the dolls I have been given, won and made.The first doll was made by Veronique Douillet, and the third one along is made by Belinda Schneider from Bel's Nook. The woven baskets are from New Zealand- one is a harakiki made by Maori women and the other is made by Tongan women- I love baskets! It's so nice to be able to display them in my home. I think I want to build a little altar out of recycled wood as well to display some other things I have collected over time. Work is progressing on the book- I will be able to ship any books ordered on Wednesday arvo or Thursday morning. The cost of the book is $28 US, or 22 euros, 14 GBP ( and the prices include airmail shipping) and within Australia $25 inclusive of surface postage. I can be paid via Paypal- just email me. If you order now they will arrive in time for Christmas. I will blog the cover sometime this weekend. Imagine my surprise this morning as I turned into our drive to ba faced with a wallaby! Unfortunately I did not have my camera- but it seems he is resident here because I also saw him one night ( or maybe it's a her) I will try and get a photo- they are so sweet. And then my daughter walking home from the school bus saw a koala walking along the road- you rarely see koalas in this area- and several other people have reported seeing them so perhaps they have moved in. I will try and make sure I don't go out without my camera- just in case I can get a photo for others to see. I am getting coy now- no more pictures of the progress on 72 MORE Ways- you shall have to wait for the book! But whilst I haven't progressed as fast as I had planned- it will be available in book form next week! Progress has been impeded due to the fact that I have had to move things from my studio/shed as a certain person disconnected the power that used to run from the old house ( and for which I was willing to pay- it kind of blew the wind out of my sails ). The matter is complicated by the fact that the table at which I work is very heavy ( stops the machine vibrating) but there is no way it will fit in my Micra, and I have to admit it is amazing what I can actually fit in the Micra- and so I have had to resort to a small computer desk- and that is really uncomfortable to sew at. MY ability to dye has also become complicated- I will think on it in the next week or so when I have finished 72 MORE Ways. So the photo is of some of the muslin fabric I have dyed it the past. This is true muslin- light weight and delightful to sew. It is what I used for my Travellers' Blanket. It is for sale at $35US a piece ( including shipping)- the width is 40 inches by 45 inches long except the orange and black piece which is a bit smaller but has had an extra process applied to it. Ohhh and during the night my 200.000th visitor attended my blog- the reader is from Budapest in Hungary, please make yourself known to me and I shall send you a little surprise. Thank you one and all to my faithful readers- I have been despairing the last month because I haven't been able to write as much as I normally do when I am not travelling, but life got in the way and the lack of internet connection didn't help! Work is progressing on Seventy Two MORE Ways- little did I realise the real challenge this would present when I so sunnily announced I would be doing this book. My goodness coming up with 72 more continuous line motifs has been hard work! I have done the drawings first because I needed to see whether some of the designs would lend themselves to a continuous line- so now they need to be sewn. My machine ( a Husqvarna Designer II) is still being temperamental- yesterday it was fine but today it is not a happy little vegemite- maybe its the driver? But the sewing will be done Tuesday all things going well- and it is the type of book that writes itself- so I should have it printed by the weeks end.So place your orders now so that you will get the book in time for Christmas. I can be paid via Paypal for those that are overseas. I must admit to feeling rather flat these last few weeks and haven't achieved anything I set out to do. So today I made a determined effort to do something as I find that usually gets the ball rolling.I have also been thinking I would love to work with someone else around to help push through barriers- but there is no one really near where I live who is involved in the kind of stuff I do. I could do with some brainstorming and enthusiasm! 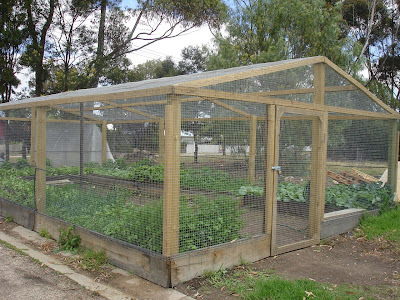 I did teach at Bairnsdale on the weekend and that was fun-we used the community house to do the workshops and this was the community house vegie patch which was enclosed in netting. This is because the birds are numerous and destroy almost any food crops. I would love to have a vegie garden under cover like this one. I did manage to put in all my vegies- it's only a small patch, but everything has been planted and mulched with pea straw- so hopefully things will grow! Have made a little progress on 72 More Ways- my machine is not in a co-operative mood and I can't work out why- maybe when she realises it's on for earnest now she will think differently of it! Oh and I keep forgetting but all the My Place quilts are now on the website ( The quilts are from Australia, New Zealand and South Africa). They will be coming back to Australia soon for exhibition at the Australian Quilt Convention - where i am also teaching in late February. It's amazing what you find when you move house. I have been trying to find these tifaifai's I made some time ago for a couple of years now, but do you think I could find them? And then when you are not looking they reappear- I am sure they planned it! I am still thinking of writing another tifaifai book as my other one has gone out of print. And of course they had to be pomegranates as well- Demeter is sending strong signals - I am finding pomegranate things everywhere- or maybe I have just made lots of pomegrante things! 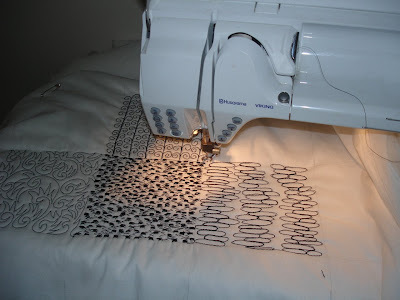 I am making progress on 72 More Ways- it's quite a challenge finding 72 new things for machine quilting- in fact I have run out of ideas for the day- I hope some new ones arrive during the night! This weekend I have to go and teach at Bairnsdale.I have also been thinking about doing an on-line workshop on lino-cutting and printing with lino on fabric , when I work out how exactly I am going to do that! 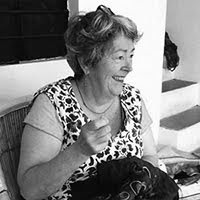 Hoorah- finally we are connected to the internet and I can get back to a bit more regular blogging- I have missed it, as it seems to make me do the work so I have something to blog about- not a bad thing! I have been doing line drawings to explore more textures for quilting and could not resist a pomegranate one. The pomegranate/Persephone metaphor seems to be a recurring theme in my life- and so it is again, almost unconsciously- this time it is a new start! And whilst moving stuff I found the above quilt which I made as the coloured version of my 72 Ways Quilt for the French book-alas I had made it the wrong size and so had to make another exactly the same as the white and black version. I am not sure what I was thinking. Anyway it is for sale in case anyone is interested . It measures 34 inches by 39 inches and is heavily stitched with lots of different free machine motifs. It is yours for $450US inclusive of shipping. We still have no internet connection at our new home- very frustrating in this technological age to have a three week delay before phone and internet are working... Hence no photos. We are now settled into our new house and getting into the rhythm of being there which means I can get back to what I really need to do- which is work work work. I am working on a new book entitled Seventy Two MORE Ways not to Stipple or Meander- and you guessed it , it is 72 more ideas for free machine stitching. My schedule is to finish it by the end of next week so I can get it printed. Any pre-orders will be welcome ( as then I can determine how many I will print the first print run). I will do it in the same black and white format of my previous book and I will also add directional drawings . If you are interested please send me an email first.